The political journey of the leader of the Traditional Unionist Voice has been from a stalwart of the Democratic Unionist Party to that party's arch critic. Born in Crossgar, County Down, in 1953 to a farming family, Jim Allister began his career with the DUP in 1971, but left to return to a career as a barrister after disagreeing with party policy. Mr Allister famously fell out with the then DUP leader Ian Paisley in 1987 when he was not allowed to stand in the general election in East Antrim because of a unionist electoral pact. Peter Robinson subsequently brought Mr Allister out of self-imposed political exile to contest the European election for the DUP in 2004. He topped the poll, exceeding even Mr Paisley's percentage share of the vote, if not the number of votes cast. But Mr Allister quit the DUP again in 2007, this time over his dislike of power-sharing with Sinn Féin. But rather than return to his other job as a barrister, he held onto his European seat and formed a new party, the Traditional Unionist Voice, as a vehicle to drive his opposition to the Stormont executive. Politically, one of his finest moments came in the Dromore council by-election in February 2008 when his party made its electoral debut, gathering 739 votes and effectively depriving the DUP of the seat. He lost his European seat in the 2009 election but, as a North Antrim assembly member, has continued to make outspoken attacks on the DUP and Sinn Féin. In 2013, Mr Allister succeeded in getting a private members' bill passed preventing anyone with a serious criminal conviction being appointed as a Stormont special adviser. In October 2014, Mr Allister was barred from speaking in the assembly for a month due to a clash with a deputy speaker. 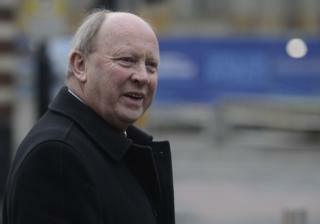 The TUV leader was told his behaviour towards Ulster Unionist Roy Beggs was "among the worst the assembly had seen". He strongly opposed the Fresh Start agreement in November 2015, calling it an insult to victims.